However, here is the first problem with the statement. 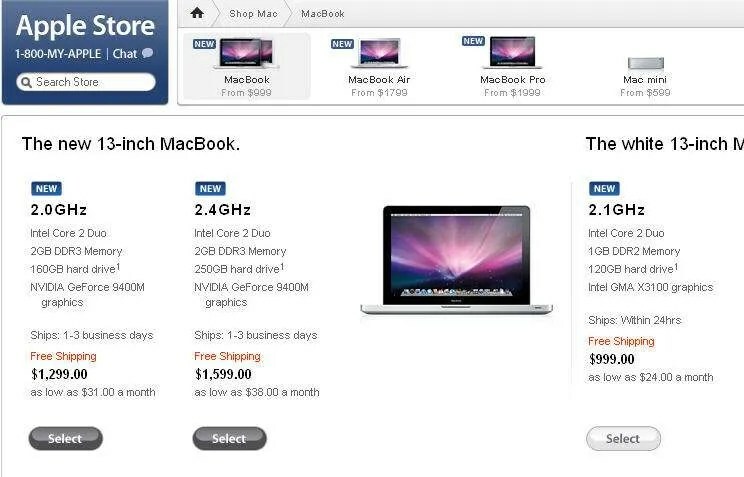 The 2.4Ghz MacBook version offered today is $1599 and the 2.4 Ghz MacBook Pro version offered yesterday was $1999. That’s only a $400 price drop. I then pulled up the similar data from today’s specifications for the MacBook. The idea here is to get a fair assessment, based on Apple’s words yesterday and today, about whether one really gets the same value for less. So by the look of it,it’s not an exact match. The screen of the old MacBook Pro is, of course, larger, which accounts for it being heavier and bigger. But other features seem to have disappeared: The 2 firewire ports are gone, as is the ExpressCard slot; So is the antiglare screen (with glossy available as an option instead of a default) and the DVI port. Oh, and the supported screen resolution goes from a top of 1440 by 900 to 1280 by 800. On the plus side, the multi-touch pad is a glassy button-less one, a new video card is available, as is a larger hard drive (50 more Gb to use) and a speedier motherboard is available. Also, it appears that the battery is now a 45-watt-hour one instead of a 60-watt one so I suspect that there are some power enhancements in this new machine. Are the two machines similar? No. However, each of them has pluses and minuses and they are only $400 apart which, considering some of the things that have been dropped and added, seems to point to a machine that, assuming depreciation, is probably in line, price-wise, with the earlier one. That’s not at all what Steve said. What he said was that there were three things (Metal Enclosure, Backlit LED display, Faster Graphics) that MacBook owners were asking for. 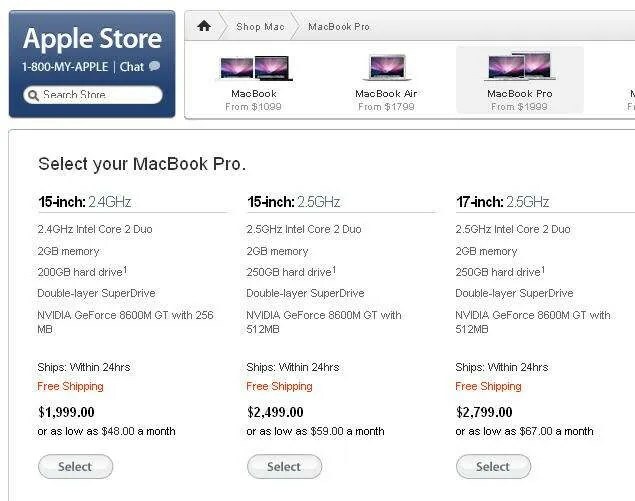 To get THOSE THREE THINGS before would cost you $1999, but now, you could get THOSE THREE THINGS for $1299. Thus the $700 savings. He never said the new MacBook was exactly the old MacBook Pro. Only that the features people were complaining most about were now offered in the cheaper consumer line. Also, the difference is $400, not $300. If you’re going to get into that much detail (which I actually found quite helpful), you’ll have to get the price difference right, too.